The findings are diagnostic of a nodular keloidal form of scleroderma. 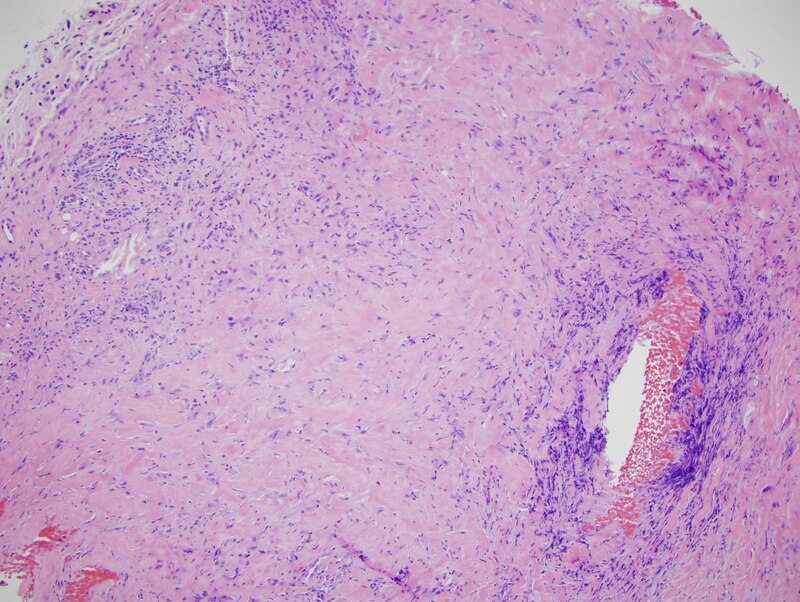 In particular, there is a pattern of fibrosis that one attends to associate with a keloid or hypertrophic scar characterized by nodular hyalinizing fibrosis with a myofibroblastic pattern of hyperplasia. Interestingly, however, there are additional findings that are encountered in scleroderma. In particular there is a lymphocytic vascular reaction with basement membrane zone reduplication of vessels potentially corresponding with an autoimmune based endothelial cell injury syndrome typical for scleroderma/morphea. Secondly, there is a lymphohistiocytic infiltrate coursing through the interstitium with scattered eosinophils, a finding encountered in both localized cutaneous scleroderma and systemic scleroderma. 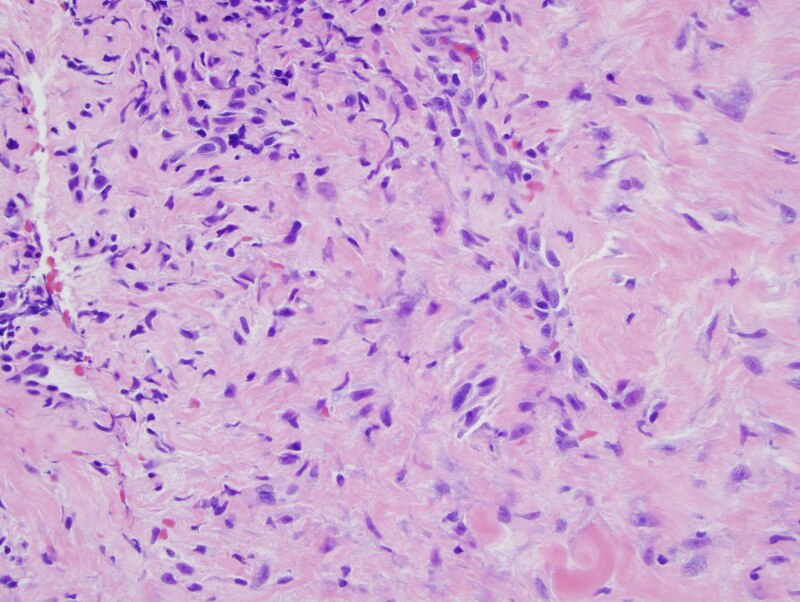 The additional finding of lipomembranous fat necrosis, while not specific, can indicate ischemia, which is certainly part of the pathophysiology of both localized cutaneous scleroderma and systemic scleroderma. 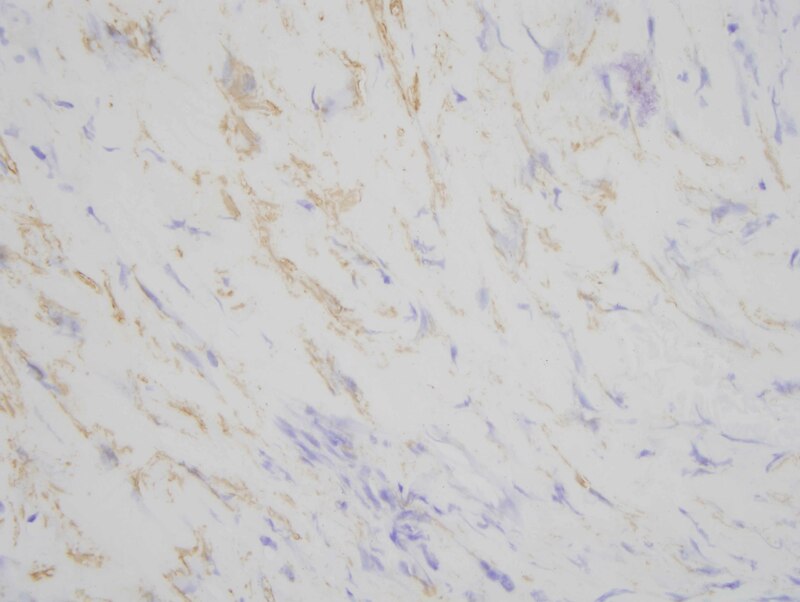 Finally, the phenotypic profile is typical whereby the fibroblasts show the typical procollagen phenotype as characterized by smooth muscle actin staining with a loss in the expression of CD34. 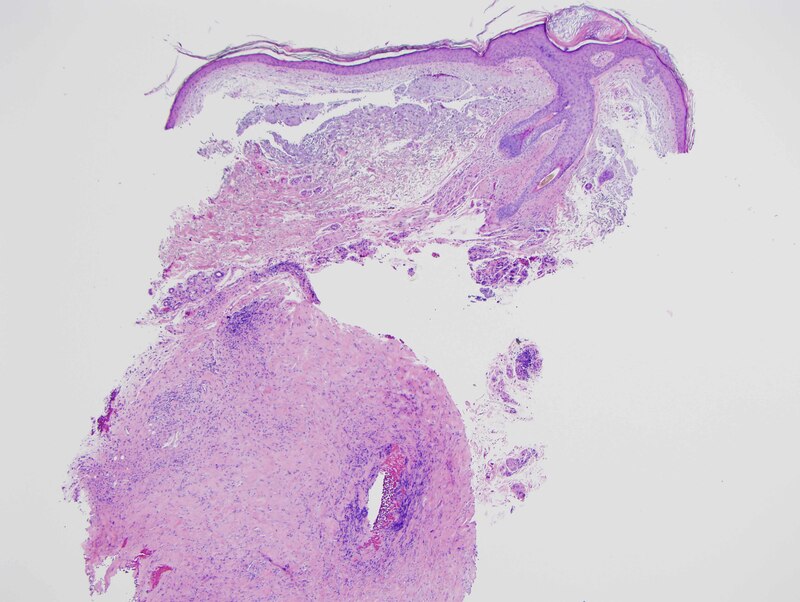 While keloidal nodular sclerodermoid reactions are not well recognized in the spectrum of chronic graft versus host disease, given the similarity clinically and histomorphologically between chronic sclerodermoid graft versus host disease and autoimmune scleroderma, be it in the context of morphea or systemic scleroderma, it would not be surprising that a rare form of scleroderma, namely nodular keloidal scleroderma could potentially be seen in chronic scleroderma graft versus host disease. When one considers nodular or keloidal scleroderma there are only 17 cases published. Most patients in fact, do have systemic sclerosus, but some in fact have localized cutaneous scleroderma. The designation of nodular/keloidal scleroderma is used even though there may be some subtle morphologic nuances between nodular scleroderma versus keloidal scleroderma. One must reserve the term of nodular keloidal scleroderma for skin lesions where there is a nodular keloidal-like pattern of fibrosis in an established lesion of scleroderma as opposed to the development of a keloid in a patient who has scleroderma, whereby there are no concomitant changes of scleroderma. 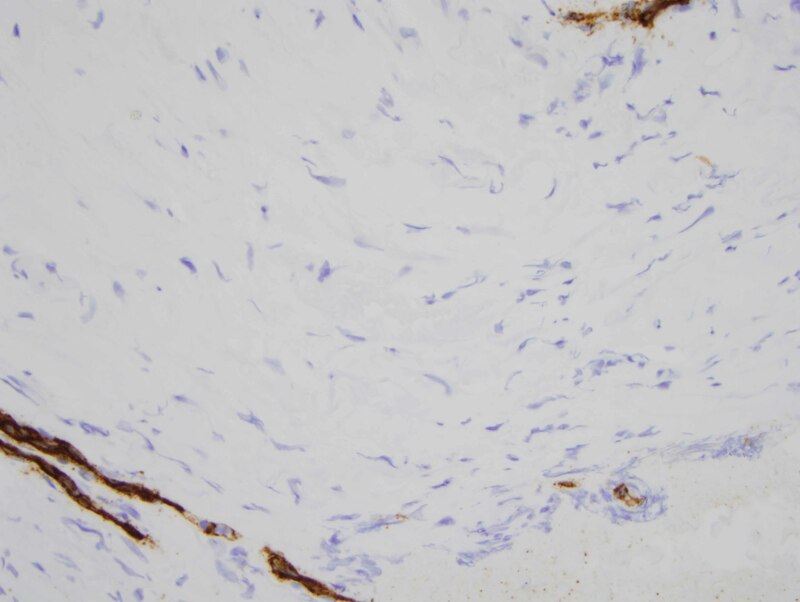 In this case, the microvascular changes, a background of lymphocytic infiltrate and the phenotypic profile is quite characteristic for scleroderma even though the nodular fibrosis and the degree of myofibroblastic hyperplasia is obviously unusual for conventional scleroderma.